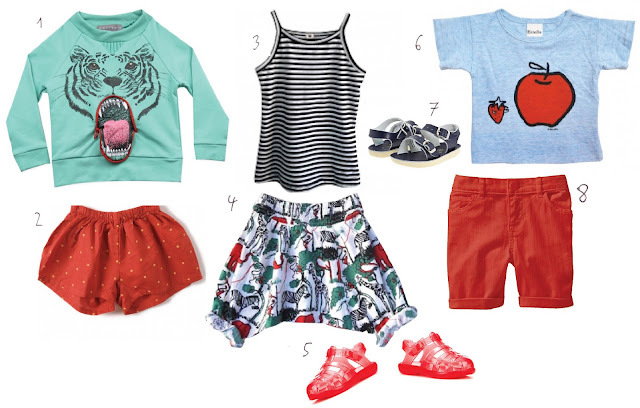 with the new inclusion of girl's fashion here, i still have the most fun putting together post like this for boys. did i really write that?!! (although a girl would look adores in any of these outfits.) i find it more fun to play with prints and colors. with girl's clothing it is so easy, you walk into a shop and bam! there is a dress that makes your heart skip a beat. by the way, check out that tiger braces sweatshirt the mouth unzips open! i know my son would flip for that. This post has so many of my favorite things! Stripes, red, harem shorts....so adorable! Love it! Oh I love this post...Summer come Quick!